A complete archive of every edition of Freedom’s Journal can be found at www.wisconsinhistory.org. Decades before Frederick Douglass published The North Star and more than a century prior to John H. Johnson’s Jet and Ebony magazines, freedmen Samuel Cornish and John B. Russwurm established Freedom’s Journal. Founded in 1827, the newspaper was the first to be written and published by black Americans, thus giving birth to the Black Press. The core tenets of Freedom’s Journal, set forth by its editors’ declaration, “We wish to plead our own cause,” established the precedent for nearly all black news outlets to come after it. In a social and political climate that limited or even forbade all black Americans from sharing any news or matters of opinion on a public forum, the paper was not only an outlet but also a resource. It provided readers with information about new developments in predominantly black countries like Haiti and Sierra Leone while also engaging the life of black communities around the nation with wedding announcements, obituaries and even biographies of well-accomplished black figures of the day, such as poet Phillis Wheatley and Haitian revolutionary leader Touissant L’Ouverture. Russwurm and Cornish agreed that a black paper should inform, entertain and empower its readers. 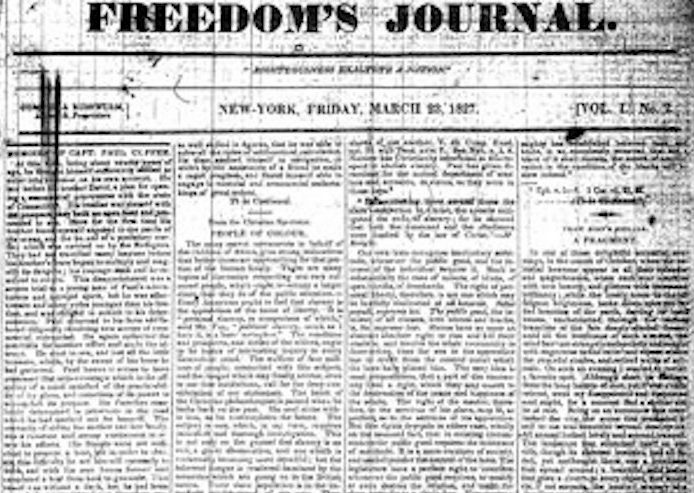 Freedom’s Journal ceased publishing in 1829, after Cornish resigned and the paper adopted a pro-colonization attitude, resulting in the departure of a majority of its readers. Its legacy was not lost on them, however, as by the end of the Civil War, more than 40 black-owned newspapers emerged in cities across the new United States, including Douglass’ North Star.